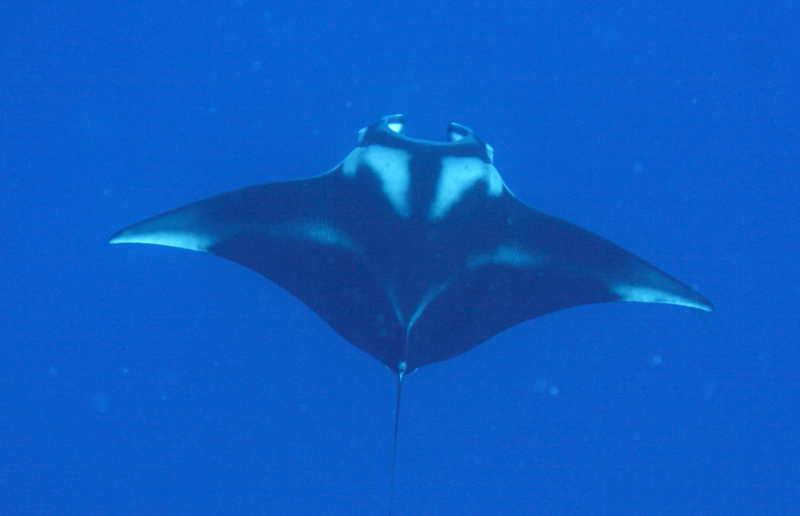 Until as recently as 10 years ago very little was actually known about manta rays and this project was initiated to study the behavioural ecology of mantas from observations in the field. The project began in November 2001 whilst we worked as dive guides in the Maldives. High on the diver’s wish list was a dive with manta rays (Manta alfredi is the species we commonly see in the Maldives) so every week a number of dives were made at known cleaning stations in order to observe them. 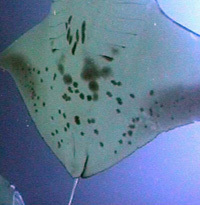 We were not sure whether we saw the same mantas every week or different ones so we developed an method to identify them individually based on the spot markings based on the ventral side of each manta (see Compare Mantas for more information on identification). We now know there are two species of manta ray, the Alfred manta (Manta alfredi) and the larger, more pelagic, giant manta (Manta birostris) shown in photo below (photo: John Rochester). Manta birostris is found across the world in tropical waters and occasionally travels into colder water with regular reports as far north as New Jersey USA and possibly from Newfoundland and as far south as New Zealand. It grows to at least 6.8m disc width (DW) and has a distinctive cartilaginous mass just behind its dorsal fin which covers a spine. 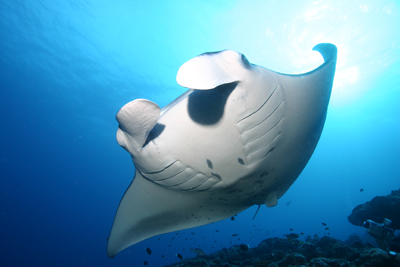 Manta alfredi is smaller, growing to about 5m DW and is reported mainly from tropical reefs. Current research projects include investigations into the social behaviours of individual mantas, including whether they form groups and close associations, agonistic behaviours between individuals to determine priority at cleaning stations and co-operative behaviour whilst feeding. Our other research projects continue, including a study on cleaning ecology, the ecology of the isolated population of Addu atoll and a study of juvenile mantas in sheltered lagoons.